Today, I’m going to take you through my latest tiny stitching adventure and tell you my thought processes and how they didn’t work, but then how they did work, and hopefully convince you that it’s ok to plow ahead even when the results of your stitching are looking a bit dim. My adventure started when I succumbed to the temptation of working the elements of Late Harvest (an embroidery project designed by Hazel Blomkamp and featured in her book Crewel Intentions) completely out of order. And I’m starting with a photo of the semi-conclusion of the adventure, just so you don’t get discouraged. When you’re working an embroidery kit – and even when you’re working your own design – there’s usually a certain order of work to follow, depending on the type of embroidery you’re doing. In this particular project (which I’ve written about in detail here, if you’re just joining in), a whole bunch of embroidery techniques are employed, from regular surface embroidery, to beadwork, to stumpwork. If you’re not sure what stumpwork is, it’s a three-dimensional embroidery technique, often involving elements stitched separately using wires for stability and shape, and then those elements are cut from their fabric and added to the main project. You can learn more about stumpwork here, in my review of an excellent stumpwork class that’s available online. Now, because stumpwork elements are three-dimensional (they stick up off the fabric), and because they involve things like wires, the stumpwork elements are normally added as the last step in finishing off an embroidery project that features stumpwork. 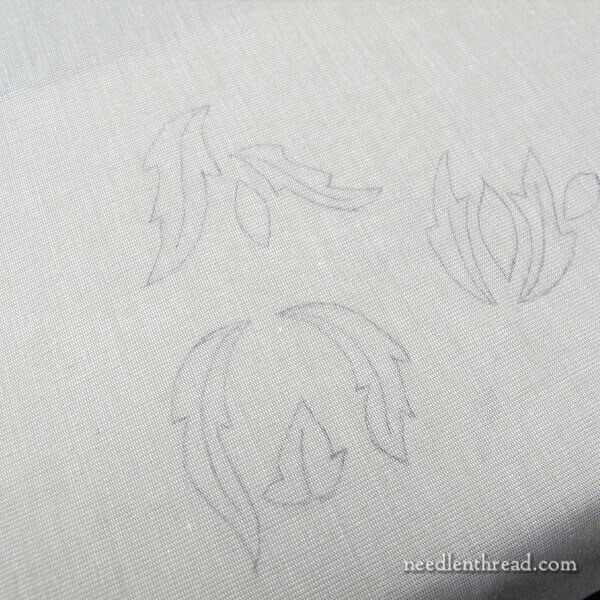 It’s a good idea to wait to the end, because you don’t want your regular surface embroidery threads to go to war with 3D elements that are sticking up everywhere on your fabric. It just makes sense to add the 3D stuff at the end. But sometimes, when you’re working on a kit, you might do what I do. I like to hop around to the elements that interest me, that entice and beckon me to the point that I can’t resist at least trying them. And such was the case with Late Harvest. I was really keen to get going on the stumpwork elements, even though I’ve not finished even a fraction of the surface embroidery in the project. And that’s ok, because I can work the stumpwork pieces on separate fabric and then wait until the end to add them to the overall picture. So, that was my plan. I decided to ignore the recommended order of work and to jump forward to fiddling with stumpwork. I resolved before I started the stumpwork pieces that I would follow the designer’s instructions to the letter. And then I oscillated in my resolve. And then everything came out ok.
First, there was the matter of transferring the stumpwork design elements to the fabric used for them. Following Hazel’s instructions, I grouped these elements – I thought there were only three groups at that point, but then I realized I was wrong – into the center of the stumpwork fabric, so that they would fit comfortably within the confines of a hoop. 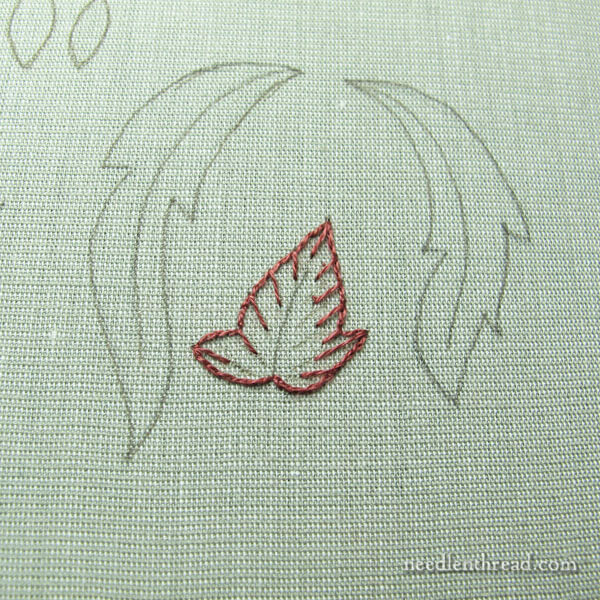 Then I realized that there were several more bunches of stumpwork leaves that had to figure in on that fabric, and so I traced them, too. All the stumpwork elements have to be traced on the stumpwork fabric and the embroidery on them has to be completely finished before you can actually cut any of them away from that fabric. This conserves fabric, and since this is a kit, I don’t want to waste any of the fabric and come up short in the end. In order not to be confused by which group was which, I labeled each group of stumpwork elements with some little code words and letters, the meanings of which I will have undoubtedly forgotten when it’s time to cut the pieces out and place them on the project. According to Hazel’s recommendation, I made sure all the elements could fit inside an 8″ embroidery hoop. Only the 8″ hoop didn’t really fit well on the fabric, so I made sure they fit inside a 7″ embroidery hoop. It’s a little cozy, but it works. 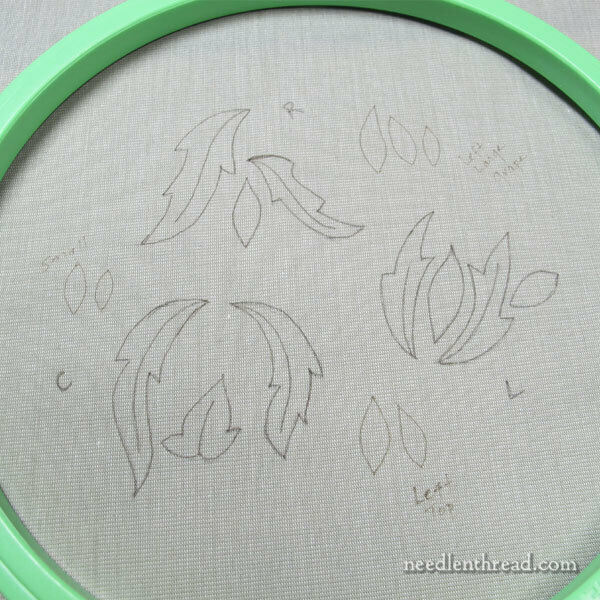 Hazel recommends using a plastic hoop for the stumpwork pieces, so that, when you’re finished stitching them, you can actually leave the fabric in the hoop and wash the piece (still in the hoop) and let it dry (still in the hoop). This eliminates the extra step of blocking or damp stretching the embroidery. After making sure all the elements duly fit in the hoop, I framed up the fabric on Evertite stretcher bars, thereby totally ignoring the designer’s advice. There’s absolutely no reason you can’t use the plastic hoop. But for me, it just didn’t work out. Well, truth is, I didn’t even bother trying. Three reasons: 1. I am not in love with plastic hoops; 2. I wanted both hands absolutely free to do the stumpwork, and a frame allows me to do this because I can clamp it onto my floor stand; and 3. I prefer the consistent tension a frame gives me. So…so much for following the instructions to the letter. At this point, I re-resolved to follow the instructions to the letter, and continued forward. And then I read the instructions and found myself backwards again. The leaves are worked in long and short stitch shading, from the center vein out to the edge. I’ve already discussed this at length, in my last article on Late Harvest. It does work, going in that direction, from inside out. But for me, it’s completely backwards and it feels funny. And the day I sat down to do this, I was already feeling discombobulated in other ways. I didn’t want one more discombobulation to deal with. And so, again, I ignored the designer’s recommendation. 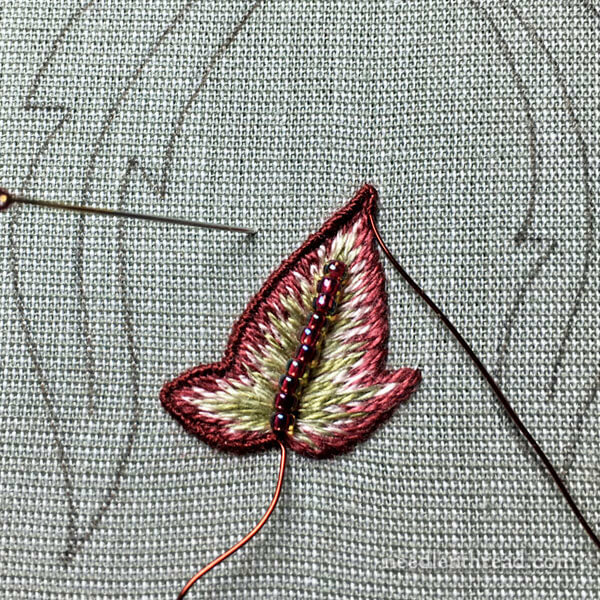 I worked the leaf in the traditional long-and-short-stitch way, outlining first with split stitch, then working from the outer layer of color and filling towards the growth point in the leaf. 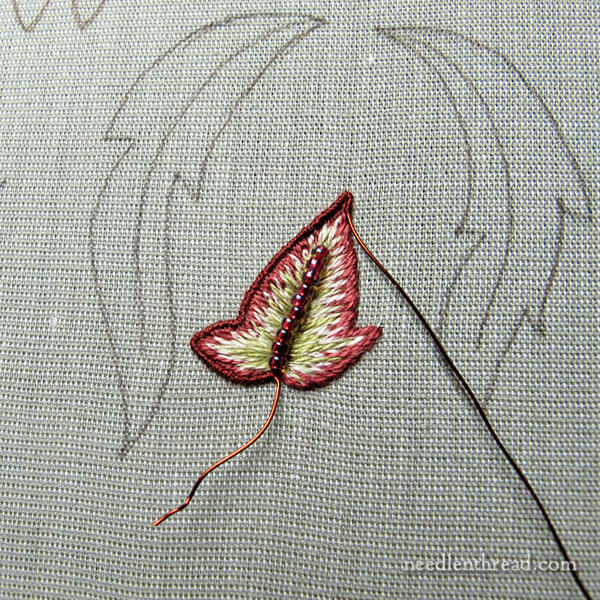 If you want to see this method at work, you can learn all about using long and short stitch for filling leaves in this tutorial on long and short stitch shading for simple leaves. And, in fact, the outcome was probably the worst long and short stitch shading I’ve ever done in my life. It just looked awful to me. I knew part of the problem was that I wasn’t using magnification, even though (deep down) I knew I needed it. The element is small. The background fabric has a little sheen to it. These things play with your eyes and makes it hard to see things perfectly clearly. Another part of the problem was that it’s a tiny element and I was squeezing four shades into it, trying to ensure the majority of the shading was towards the center of the leaf. And that makes things rather tight and sticky when you get to the middle of the leaf. In any case, though I wasn’t pleased with the leaf in general, I decided to plow forward and to follow the rest of Hazel’s instructions for the rest of the leaf. 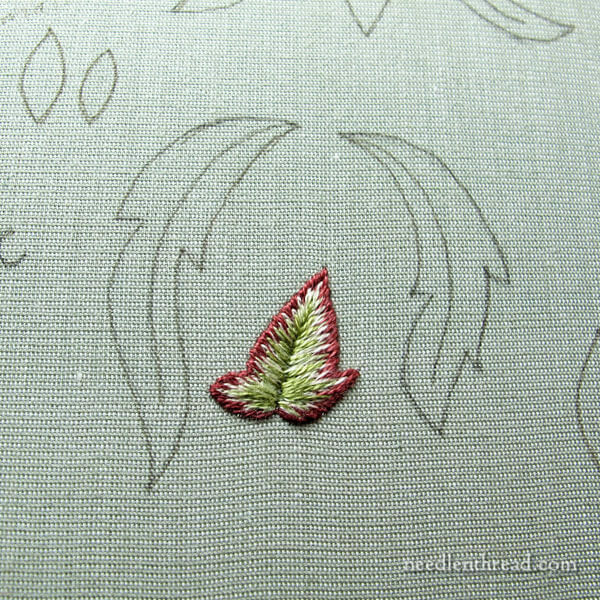 Once the beaded vein was couched in place and the stumpwork wire outline begun, I was a bit more pleased with the leaf. I thought to myself, Self, this looks ok. No need to fret. Now, another point to mention – if you haven’t noticed it – is that the stumpwork wire is added at the end, after the leaf is embroidered. In most stumpwork approaches, the wire is stitched on first (usually using buttonhole stitch), and then the element is filled from the wire, inward. Hazel doesn’t do it this way. 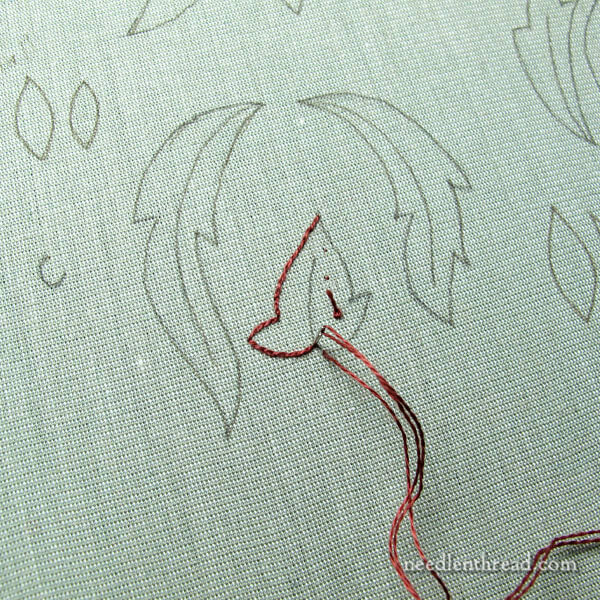 She embroiders the inside of the leaf first (from inside to outside) and then she fixes the wire to the outline of the element by stitching tiny overcast stitches (like satin stitches) over the wire, around the leaf. This was a surprise to me, because I’ve not worked a stumpwork element in this way before. But it works. And in fact, I like it a lot. I like the overcast stitching over the wire better than buttonhole stitch. And I like the way the wire hugs up right next to the edge of the leaf, creating this smooth, cord-looking outline around it. Just to give you an idea of how small the leaf is, the tip of my index finger (which could use some TLC these days) covers it completely. Overall, I’m pleased with the way the leaf came out. 1. You don’t always have to follow the designer’s directions. 2. But sometimes, it’s a good idea to follow the designer’s directions. 3. If an element in your project is not coming out exactly as you would wish, instead of starting over, consider plowing through to the end. You’ll have a better perspective when the embroidery is completely finished. What might have looked shoddy at first will most likely look a lot better once it comes completely together. Now, the question is, do I work the rest of the stumpwork elements before going back to the main design, or do I go back to the main design and leave the stumpwork for later? Or do I trade off – a little stumpwork, a little surface work? I’m still debating these fine points. I do like your Snafu (not heard of this word before but great expression for chaos). I agree about working with a hoop I do like to use two hands especially with stumpwork and it looks more spread out on a stretcher frame. It’s funny how we are set in our ways and how we find it hard to change techniques, the flower turned out really well and I like the idea of overcast stitches it looks lovely. Oh the dilemma’s of needlework I would suggest you go with what you feel like doing, perhaps a bit of stitching here and a bit of stumpwork there when you are bored with the main design. Thanks for sharing your techniques with us and for your dilemmas with the project. I hope you are feeling well and I do hope you have a great weekend. The pattern is lovely that you posted yesterday I had a visitor and was busy with my fabric journal which is coming to it’s end, just adding the final trinket touches. I say stitch a little both ways, see which works best, and go from there. Also, “dicombobulated” is one of my favorite words (although not one of my favorite feelings). And every time I read about how you are NOT following Hazel’s directions, I have to chuckle a bit at how stubborn you are! I think the finished leaf looks lovely. It must be iddy biddy to fit under the tip of finger – how tiny are those beads! Now I am going to give you my advice about which order to work the rest of the stumpwork and the main design. 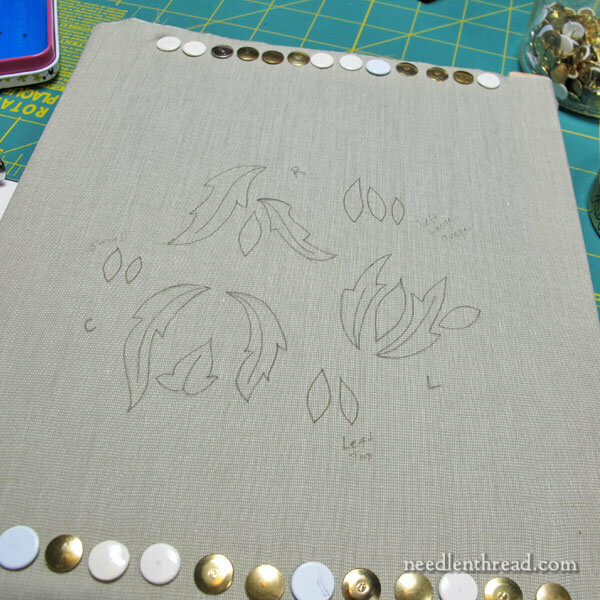 When you feel like doing some stumpwork – do some stumpwork. When you feel like doing some of the main design – do some of the main design. You are braver than I. Or perhaps I am just too ….. what’s the word? CDO? (That’s OCD, but with the letters in alphabetical order). At any rate, I rarely, VERY rarely, stray from instructions in a kit. So if you are asking me, I’d say stick with the instructions from now on. But since you are doing pretty darn well doing your own straying, go with your gut. It is fun watching you go through this process, Mary. Hi Mary and thanks for this. I was pondering a major unpick until I read your comments. Inspired by your experiences I just went back to ‘re-assess’ and now think I can finish the offending area quite happily. I’m sure whichever way you decide to finish yours you will have a beautiful piece of embroidery at the end. Aren’t designers’s directions guidelines, rather than commands? Thanks again and have a good weekend too. I think the leaf looks great. I can’t see 4 different colors though. In a leaf this size, 3 colors would probably work just fine. In regard to sequence of stitching, when I start a project I often stitch the parts that interest me the most. At some point I realize that soon I will have only parts that I DON’T like to stitch much. When I get to that point, I make a deal with myself, and take turns stitching what I like to stitch and what I don’t like to stitch. It’s very hard to finish a project when all I have left are things that aren’t very interesting to me. Also, as I get more skilled, I’m much more prone to not follow the directions. it’s easier to know beforehand whether something different will work and if it doesn’t, whether I can fix it. I love to see your work and hear about the process. I think that teaches us so more than a set of instructions. I do understand that sometimes you have to ‘plow ahead’ even when things look a little cattywampus. When I’m working on filling stitches in a piece of needlelace, there’s always a point at which things look ‘bad.’ The stitches are trying to scrunch and curl and it looks like a three-year-old did those stitches! But if I stay calm and trust the process, things turn out fine. After all, a kit or a pattern is just a guide, isn’t it? I do enjoy hearing about all your trials and tribulations! Sounds exactly like the stuff that goes through my head on a daily basis!! I have not done any of Helen’s kits or designs — it sounds as if she has her OWN way of looking at (and doing) things. That is always good to experience. We DO seem to get rutted very easily! I also hear you loud and clear about sometimes pushing yourself to complete a process, even though you are not “feeling it” mid-way through. Very often, I find, it DOES come out looking better than you had imagined it would. When we are accessing each thread as we place it, we lose sight of the “forest for the trees”. You are such a good teacher, Mary! The leaf is lovely, especially when you show how very tiny it actually is. Now as to following instructions, I am one of the world’s worst – even on my own designs, I don’t always work things in the way or the order I intended to work them. My alterations are not always successful. Still, learning what you can’t get away with is sometimes as useful as learning just how much you can. Even if it is an expensive lesson. I don’t blame you wanting to try out the little leaves at the earliest opportunity – I think I’d have been doing that too. Mary – I have always worked with hoops, I have never used a frame. I prefer the plastic ones – the older ones which do not have a ridge – but also use wooden ones – these days the good German ones instead of the cheap ones commonly around – when I do demonstrations – mostly l770’s, but also late 1800’s. I am mentioning this as you said you preferred the frame as you can put it in a stand. The floor stand I have (which I use at the late 1880’s event as it is rather loose in authenticity) holds a hoop also. It is an older one, and no longer available, but I think some of the newer ones will also hold a hoop. I love that we are doing this project at the same time!!! It is an incredible motivator for me watching your progress. I started this piece with Hazel at Koala last year – so many of us felt exactly the same way with regards to completing the long and short stitch. Hazel was wonderful and reinforced to us all that we should do what we felt most comfortable with. Interestingly- the class was split around 50/50 as to their approach and whilst everyone’s looked fabulous there was a definite difference in colouring of the finished leaves between the two groups. I am off to start my stumpwork – thank you for justifying this deviation from applying the 38 crystals so beautifully!!!! 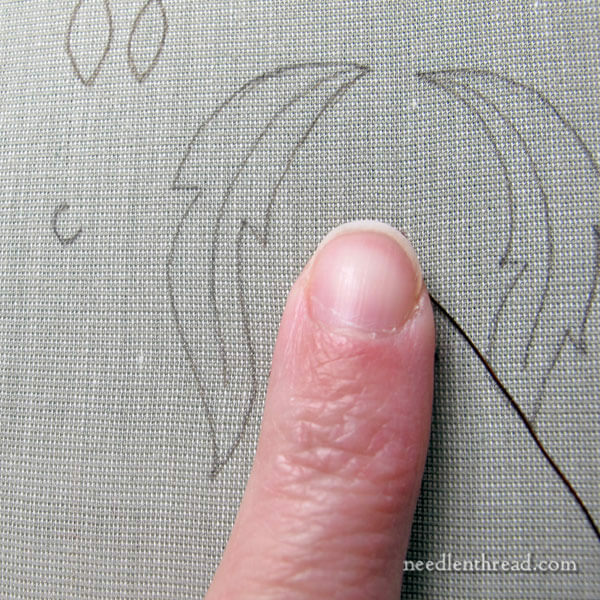 I think that Elizabeth Braun (of the Sew in Love blog) also uses the overcast stitch as opposed to buttonhole. I will have to try this. Unless I’m doing whitework I don’t wash my stitching and don’t quite understand why the kit instructions say it’s necessary. If the piece has been on stretcher bars and isn’t grubby is there really a need? Cleaning even if the fabric isn’t grubby livens up the finished piece – it brightens up the threads and brings them to life a bit more, especially with cottons. Re washing the finished stumpwork with the wire in situ. Is there a possibility of the wire rusting and spoiling get all the hard work? Also, was the wire wrapping dyed and would this dye run with washing the piece? Thankyou for your interesting projects and sharing your thoughts and beautiful work. Always a delight to read your posts! what fabric is the best for doing wired stumpwork on? In the past I have had problems with cutting the pieces out so I would love any tips on this. It’s your posts that actually inspired me to buy this kit — I’m so excited to get it and learn all of these wonderful techniques. Thank you. Oh dear Mary, I love it when you become discombobulated (btw, this is one of my favourite words but the feeling is decidedly not). I also like snafu and can only assume you are referring to the more ladylike version: situation normal all fouled up rather than the one my male cousins introduced to me many many moons ago which I won’t repeat here, lol. I agree with the comment that you do the stumpwork when the mood takes you and the rest when the mood for that strikes. Works for me. Also good to see you feeling good enough to get into this and write posts too. Very good. I just read this trying to follow you through from the beginning of the harvest project. I had to giggle so many times through it. Were we separated at birth or are all needle-workers the same? It was an opportunity to laugh at myself. You are a dear and I look forward to continuing my read and the project. To my eyes, it looked great the whole way but I know what happens when we deviate, it opens the door to doubt. Great work Mary. You probably won’t see this because I’m such a late follower but hey, I had to submit my comment anyway. Hi, Lilia! Ah, I see all the comments! I can’t always reply to them, just because of time constraints, but I do read them. 🙂 I’m glad you enjoyed the article!